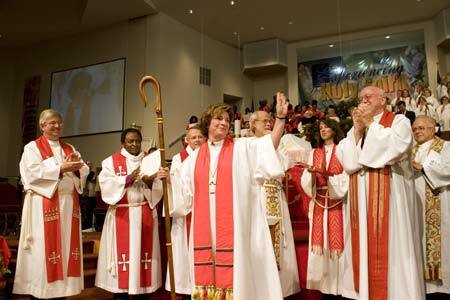 Today, the Reverend Claire Schenot Burkat will retire as Bishop with and for the Southeastern Pennsylvania Synod, ELCA. Though slight in stature, she has strong convictions of which she is not shy. She speaks with the voice of a sage and wise displaced New Yorker, simultaneously pastoral and prophetic, faithful in her pursuit of beloved community and glimpses of God’s kingdom come on earth as it is in heaven. Her integrity is awesome and she places this church that we love and serve so far above any one or personal agenda that it is as refreshing as it is unusual in this day and age. Always snapping pictures with her cellphone and lifting up the achievements and witness of others, Bishop Burkat is a friend, a valued colleague and – while I am genuinely excited to welcome and work with her fine successor, Bishop Patricia Davenport – I will genuinely miss Claire in the Conference of Bishops and on the front-lines of leadership in this church. Bishop Burkat and I have not been life-long friends, but our lives have intersected at various places along the way of faith. Both of us are ministerial children of the Metropolitan New York Synod – and both of us attended the same outdoor ministry program in high school, Pinecrest Lutheran Leadership Ministries, though we were a few seasons apart. We share a heart for evangelism that manifested in her ministry as a Mission Director for two ELCA synods and an Episcopal diocese, while I was a redeveloper and a part-timer on Bishop Knoche’s staff. Both of us, keenly aware of our privilege, have made considerable efforts to bridge those gaps in our own lives and in the church. Unlike me, Bishop Burkat is a pioneer. Ordained 40 years, she was a trailblazer among women in ministry and, along the way, shattered more than one stained-glass ceiling. Passionately on the side of the poor, Bishop Burkat has called this church into the margins, in partnership with the most vulnerable among us. Gutsy, she has demanded that the church abandon its postures of navel gazing to roll up our sleeves and enter deeply into community with one another – and the world around us. She hasn’t simply extended Christ’s invitation to “come and see” to those outside the church, she pressed us, as the church, to come and see Christ among our neighbors. On almost every issue she has taken up, I have found myself challenged as a disciple of Jesus Christ to be in deeper relationship with the church and world God so loves. Don’t misunderstand me, Bishop Burkat does make mistakes – and, frankly, she’s hocked-off more than a few people along the way! Still, one of the things that I admire most about her is her ability to say that she’s sorry – and mean it. She’s put her own money and reputation where her mouth is, and she has always tempered her prophetic voice with a genuine pastoral love for those in her care. Indeed, in victory, she has been gracious; in defeat, she has been humble and usefully chastened – learning from the very voices she seeks to lift up in church and society. In the retirement of Bishop Claire Schenot Burkat, a major leader of our church is stepping into a new season of life and ministry, leaving a void in the church’s conscience, leadership and public voice. All of us who are spiritual heirs of her ministry will need to discern how to step into that gap and continue to urge the church forward in its mission with evangelical urgency and theological integrity. Bishop Burkat – dear Claire, you’ve taught us well, you’ve shown the way and we’ll not forget you; indeed, we are in your debt. Thank you and thanks be to God for you. Wow! Thank you Bishop Gohl! ( after I slept in:) to open FB and see your post first. I bless you for your remarks and will always count you as a friend and partner in Christ’s reconciling work in the world. Love wins!